The demand for SUVs has always been there and therefore many automakers are coming up with better SUVs that offer better performance and comfort. BMW X5 has always remained among the top luxury crossover SUVs that have attracted many consumers. The new BMW X5 has managed to impress many buyers around the world with the kind of exterior design and engine performance and interior comfort that it provides. Here we take a quick look at the top features of the vehicle in the BMW X5 review below. The third generation BMW X5 is definitely in sync with the previous models and it looks like a part of BMW X range. However, there are some new features that BMW has added to the new BMW X5 to make it look grand and bulky. The overall design has been tweaked to some extent to offer better aerodynamics and that also helps the vehicle to offer better fuel economy. 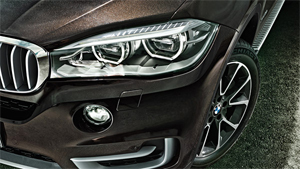 The front side of the vehicle gets a flat and wide BMW kidney grille. The headlights and the kidney grill are designed in a way to make it look like they are connected together. The front side also has large aprons and Aero Curtain and Air Breather right behind the front wheel arches. It also gets 18 inch alloy wheels and adaptive bi-xenon headlights and LED running lights. The air blade on the D pillar makes the car look wider and it also helps to offer better aerodynamics to the vehicle. The rear side of the vehicle looks equally good with the L shaped rear taillights. BMW X5 is available in petrol and diesel engines and the xDrive50i is incorporated with twin turbo 4.4 liter V8 petrol engine that produces 450 horsepower and 450 lb feet of torque. The car achieves acceleration of zero to 62 mph in 5 seconds while offering fuel economy of 27.2 mpg. On the other hand, BMW xDrive40d gets BMW TwinPower Turbo straight six cylinder diesel engine that produces 313 horsepower and 630Nm of torque. It offers acceleration of zero to 62 mph in 5.9 seconds with the top speed of 147 mph thanks to the new BMW variable nozzle turbocharger. The car offers fuel economy of 45.6 mpg combined. BMW xDrive30d get the same engine that produces 258 horsepower and 560Nm of torque. It offers acceleration of zero to 62 mph in 6.9 seconds and fuel economy of 45.6 mpg combined. Like the petrol version even diesel versions of BMW X5 meet stringent EU6 emission standards. BMW X5 xDrive25d M Sport and BMW X5 sDrive25d M Sport both models get four cylinder diesel engine. The xDrive25d engine generates 218 horsepower and 450Nm of torque while offer acceleration of zero to 62 mph in 8.2 seconds while providing fuel economy of 48.7 mpg and top speed of 137 mph. The sDrive25d engine generates the same amount of horsepower and torque but accelerates zero to 62 mph in 8.2 seconds and offers fuel economy of 50.4 mpg combined. All BMW X5 vehicles are powered with the same safety features like stability control, traction control, ABS, automatic brake drying, front side airbags, side curtain airbags, front knee airbags and adaptive brake lights. It also gets BMW Assist emergency communication system. BMW X5 gets the best interior with solid construction and high quality materials. The front seats are well designed and offer complete comfort to the driver especially for long drives. It also gets 14 way seats that offer more adjustment to the driver but that is optional. The second row seats are mounted bit low and that allows tall passengers to enjoy the space and comfort inside the cabin. However, the cargo has very average space of 75 cubic feet which is one of the drawbacks of the vehicle. BMW X5 models start at market price $47,500 and above. BMW X5 is definitely one of the top luxury crossover SUVs in the market and BMW has only added more features to it to make it even better for the consumers. The engine options only make it convenient for the users to go as per the fuel economy that they want while all X5 models get the same kind of safety features and interior options that can offer them luxury and premium feel. However, BMW X5 gets tough competition from Acura MDX, Infiniti JX and Porsche Cayenne in the same market. « Why Sell Used Cars Online for a Better Deal?